A Riemann solver is a numerical method used to solve a Riemann problem. 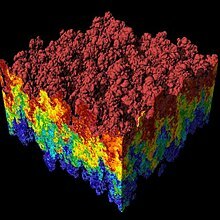 They are heavily used in computational fluid dynamics and computational magnetohydrodynamics. Godunov is credited with introducing the first exact Riemann solver for the Euler equations, by extending the previous CIR (Courant-Isaacson-Rees) method to non-linear systems of hyperbolic conservation laws. Modern solvers are able to simulate relativistic effects and magnetic fields. For the hydrodynamic case latest research results showed the possibility to avoid the iterations to calculate the exact solution for the Euler equations. Roe used the linearisation of the Jacobian, which he then solves exactly. The HLLE (Harten, Lax, van Leer and Einfeldt) solver is an approximate solution to the Riemann problem, which is only based on the integral form of the conservation laws and the largest and smallest signal velocities at the interface. The stability and robustness of the HLLE solver is closely related to the signal velocities and a single central average state, as proposed by Einfeldt in the original paper. The description of the HLLE scheme in the book mentioned below is incomplete and partially wrong. The reader is referred to the original paper. Actually, the HLLE scheme is based on a new stability theory for discontinuities in fluids, which was never published. The HLLC (Harten-Lax-van Leer-Contact) solver was introduced by Toro. It restores the missing Rarefaction wave by some estimates, like linearisations, these can be simple but also more advanced exists like using the Roe average velocity for the middle wave speed. They are quite robust and efficient but somewhat more diffusive. These solvers were introduced by Nishikawa and Kitamura, in order to overcome the carbuncle problems of the Roe solver and the excessive diffusion of the HLLE solver at the same time. They developed robust and accurate Riemann solvers by combining the Roe solver and the HLLE/Rusanov solvers: they show that being applied in two orthogonal directions the two Riemann solvers can be combined into a single Roe-type solver (the Roe solver with modified wave speeds). In particular, the one derived from the Roe and HLLE solvers, called Rotated-RHLL solver, is extremely robust (carbuncle-free for all possible test cases on both structured and unstructured grids) and accurate (as accurate as the Roe solver for the boundary layer calculation). ^ Einfeldt, B. "Notes on a Proposal", Blog entry, 2 June 2012. ^ Quirk, J. J. (1994), "A contribution to the great Riemann solver debate", Int. J. Numer. Meth. Fluids, 18 (6): 555–574, Bibcode:1994IJNMF..18..555Q, doi:10.1002/fld.1650180603.